When you need to drill accurate and consistent holes, having a great stationary tool is important. The Grizzly G7944 drill press is a cast iron, floor-mounted model capable of the toughest tasks thanks to its 3/4 HP motor. It shares the same power as the related Jet JDP-17 17-inch drill press, but with slightly less vertical clearance from the table to the spindle. It can operate at either 140, 260, 320, 380, 480, 540, 980, 1160, 1510, 1650, 2180, or 3050 RPM. The Grizzly G7944 14-inch Floor Drill Press has a single-phase TEFC (Totally Enclosed, Fan-Cooled) motor. Basically, the industrial motor uses a sealed enclosure that uses an external fan to circulate air over the motor frame to cool it. The 9-amp motor uses permanently lubricated shielded bearings and is also V-belt driven and spins at up to 1720 RPM. The Grizzly G7944 has a table offering tons of clearance with 17-inches from the spindle to the column. 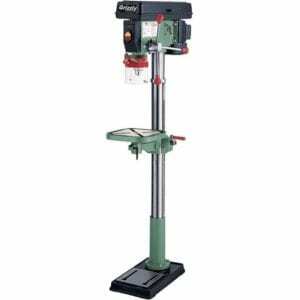 The drill press’ 11-3/8″ square work table can tilt 90 degrees left or right, and can swivel 360 degrees. Also, the work table is square with dimension x 11-3/8″. The Grizzly G7944 drill press uses a 1/64 – 5/8″ drill chuck, and there are four 5/8″ T-slots for clamping down your work materials. In addition, the machine features a crank handle operated rack and pinion vertical table movement, cushioned grip quill handles, and a built-in 60W work light. The work table has locking levers and a coolant trough for draining fluid.